Olde Green Cupboard Designs: Pinch Us!!! Well...this has been a whirlwind few weeks.... we arrived home from our fabulous cruise...then headed to Sandusky, Ohio!! Yes... we went to visit some wonderful friends that we have known since 1999!! Kyle and Mark.... they are the most energetic two fellows I've ever been acquainted with. The company began in Kyle's garage! Yes....this is one of those magical stories where a dream came true...!! Kyle started the business with his parents assisting in the shipping, order taking, manufacturing, etc. then it just exploded from there. Now...his company is known all over the world and he designs for every company under the sun and helps with their manufacturing also. We sold tons and tons and tons of their products at the Olde Green Cupboard. Now... we are designing for them! And we just simply need to be pinched! It's the most wonderful "dream come true" I have ever been a part of. The best part...Heather (daughter) and Vicky (twin sister) are part of the OGC Design Team. Our goal - bring back that ever popular PRIMITIVE LOOK to his company. You see.... his customers (almost 30,000) are screaming for it to be revived. Well.... let me just tell you... that's our middle names - Gloria Primitive Parsons! Heather Primitive Lynn! and Vicky Primitive Iannucci! Then.... home we came to get busy on our computers.... I had to take a bit of a break...had to have some surgery done (I'm fine... no big deal...) so it's a little resting for me. But you know me... my laptop is by the couch...I work a little, then lie down...then an idea pops into my head...so I sit up and work a little more... aaaahhhh what a life. My honey is taking good care of me (cooking, housework, laundry)... I'm thinking I could love this life...well...that's not true...the pain is NOT something I would like to continue.... NOT GOOD! and then working on Jan's new Applique Retreat in early October (More information coming SOON) ...then off to quilt market in Houston. 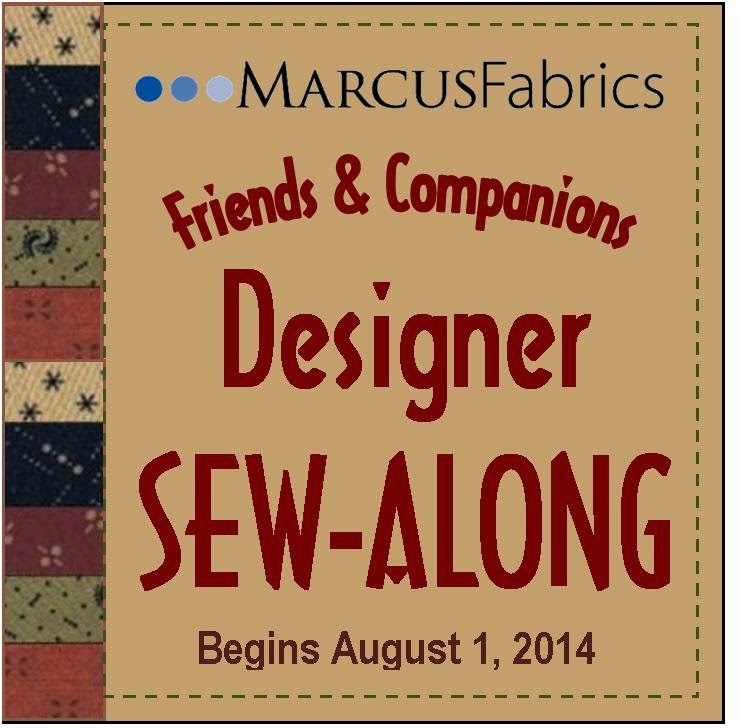 Marcus Brothers is working on our new Farmhouse Blooms line of fabric....and I simply cannot wait to see the finished fabric - then to get busy on our projects! Never a dull moment around this house...that's for sure! Take care and chat with all of you soon! p.s. Check out this great container! It's made over a LARGE vegetable can to hold your tools and trash! I'm making two more so I have one for my sewing machine, one on the ironing board and one on my cutting table. 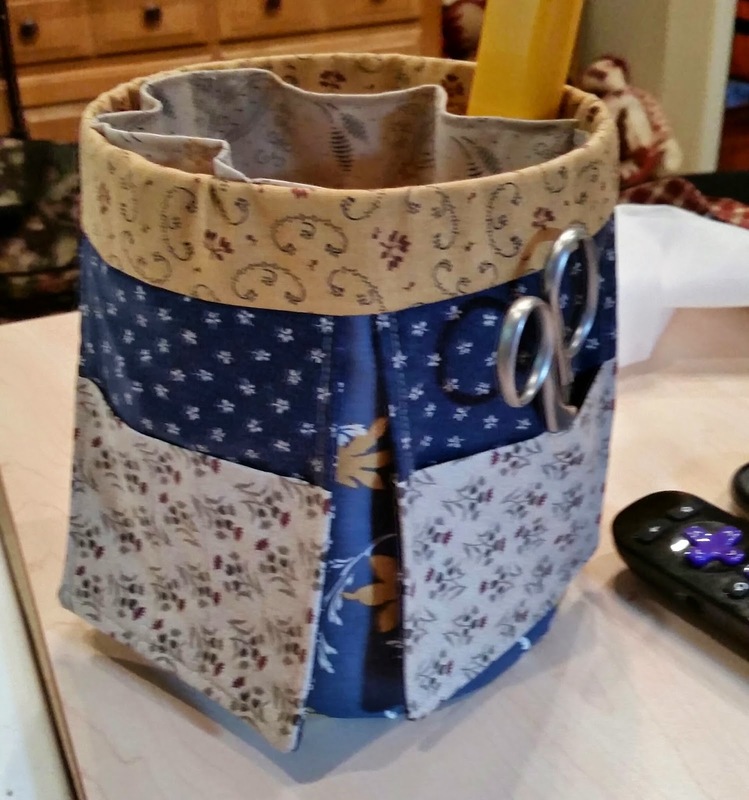 It's so easy...takes 3 fat quarters and 5/8 of a 4th fabric.